To the sounds of her teammates' cheers of “Seven! 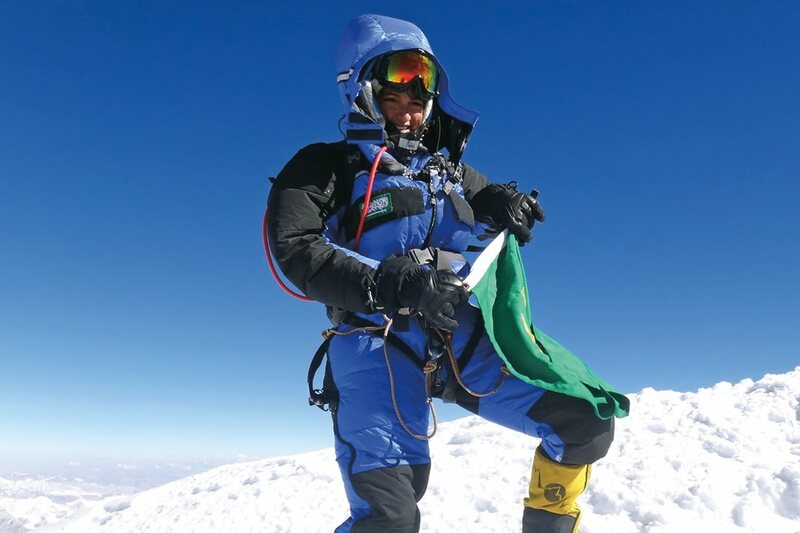 Seven!” and the clinking of their ice axes, Raha Moharrak topped Denali, North America’s highest mountain, on July 2, making her the first woman from Saudi Arabia to summit the tallest peak on each of the seven continents. The snowpack crunched as her feet hit the ground. The Arctic air needled her face. The bright red air taxi fitted with skis had just deposited Raha Moharrak and seven other climbers at base camp, 2,200 meters above sea level on the Kahiltna Glacier, amid the snowy massifs of the Alaska Range. That’s when veteran climbing guide Dave Hahn walked up to the group and looked each of them in the eyes. Moharrak knew exactly where she was—4,000 meters below the summit of Denali, the highest peak in North America. And she knew exactly the consequences of error or fate. Three years ago here, a blizzard had pinned Moharrak and her team down at 5,250 meters. They almost perished. Moharrak recalls how Hahn’s words made her uneasy. “It was a feeling I had to work through,” she says. It was June 13. Ahead lay 20 days of acclimating, trekking and climbing. From Denali basecamp, Moharrak prepared in June for her second attempt at North America's hightest peak. Few seem to notice four students near the wall whose attention is fixated on the tall, dark-haired woman in a peach-colored dress and heels. “I can’t wait to hear you speak,” one says. “Have you climbed in Colorado before?” another interrupts. Listening, Moharrak confesses she is nervous. “This is my first time speaking out of my region,” she says. “You’re wonderful,” one assures her. “I love your accent,” says another. 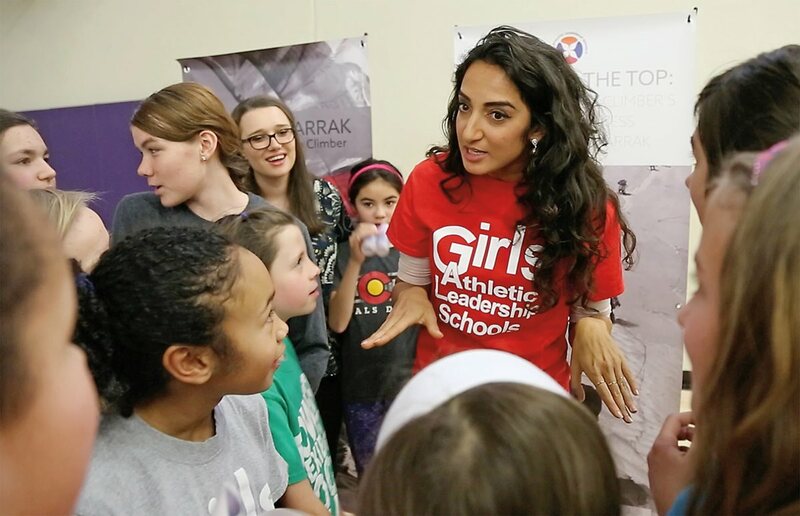 It’s January 31, and this is Moharrak’s first stop on a three-day speaking tour in the Denver area. Her talk, titled “A View from the Top,” is less about climbing Mount Everest and more about one woman’s pursuit of her dreams. It’s a topic that captivates 300 girls at a school whose mission is the empowerment of young women. As Moharrak walks to the front, students sitting on the floor begin shrieking. She waves and smiles in acknowledgment as she takes the microphone. “A lot of people ask me, ‘When did this crazy obsession with mountains start?’” she begins. How she knew she was different somehow, not fitting in all the time, but blessed with parents who embraced her eccentricity. Uncertain of her parents’ approval, Moharrak called her father. “I’ve decided to climb the highest mountain in Africa,” she told him. “It’s this high, it takes seven days, and so on. I sounded like a broken Wikipedia page,” she says. When she caught her breath and paused, there was silence. She poured herself out in an email that took all night to write, asking her father’s blessing, reminding him how he raised her to reach for the stars and to be fearless, dream big and, most of all, never, ever give up. Three days later he replied to her pages with eight words. Trekking toward the summit of Mount Kilimanjaro on Stella Point, 5,685 meters. "Talk about pushing your self, at this point I was a popsicle lol," Moharrak posted on her Facebook page. 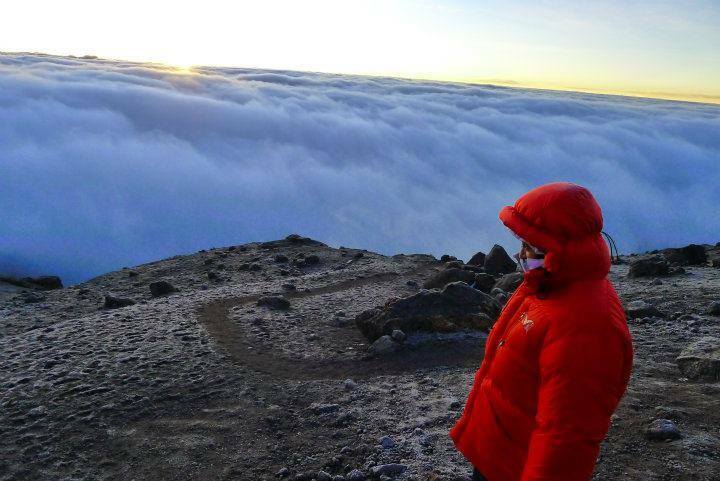 Moharrak topped out on Mount Kilimanjaro on November 9, 2011. She remembers the last few steps to the 5,895-meter summit after the grueling eight-day trek and often freezing temperatures. She reached down, picked up a rock and put it in her pocket. For her father. A tradition she would repeat. Visiting home afterward, she couldn’t stop talking about the experience. Both of her parents, Hassan Moharrak and Yasmine al-Alfie, saw the new sense of purpose in her eyes. “Deep inside I would encourage her,” Yasmine says. “I was in love with mountains,” Raha says. Love turned to obsession. She began waking early to research mountains, gear, maps, guides and training. At 16 meters above sea level, Dubai is a less-than-ideal place to learn how to climb mountains. But Moharrak didn’t let elevation get in her way. What she did have was sand, garbage bags, a backpack and dunes. 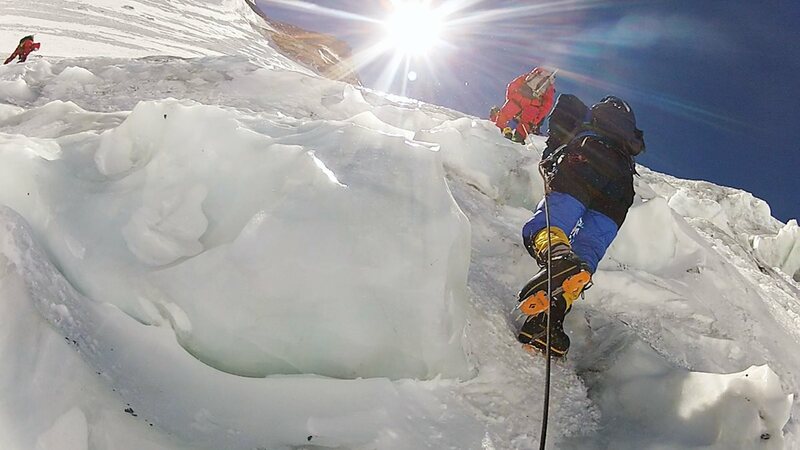 Training for Raha Moharrak’s ascents of the seven summits included technical ice climbing. 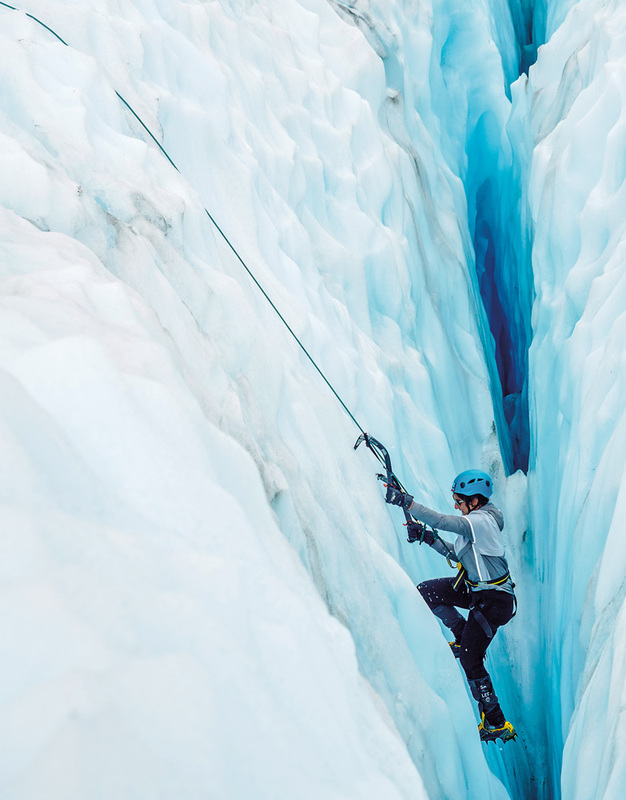 “I’m always interested in new peaks, but I love ice climbing. I love the feeling of steel on ice,” she says. As Moharrak logged more and more hours of climbing and training, she began to realize that she was capable of more than she ever imagined. “Climbing teaches you how to manage yourself,” she says. She made trips to Ecuador, Peru, Mexico, Bolivia, Chile and the base camp of Everest. “Raha will never, ever give up,” says Hassan. “She will not tell you of her future plans unless it is the right time. If [we have] any hesitation about letting her go, she will say, ‘okay,’ and she will come back to us and pull the carpet from under our feet,” he says, laughing. On August 28, 2012, she reached the 5,642-meter summit of Russia’s Mount Elbrus, the highest peak in Europe. Moharrak having a fun moment on Vinson Massif. She was wearing a crisp white shirt, she recalls, when she walked into the team briefing to prepare their ascen of Vinson Massif, the tallest peak in Antarctica. She took notes as the team discussed plans. Then a tall, thickbuilt man stood up.man stood up. man stood up. Moharrak remembers the fire his comments ignited in her. There was no way she wasn’t going to make the top. The team summited the 4,892-meter cone of rock and snow, but on the descent, altitude began to take a toll. Next thing she knew, Moharrak was wedging her shoulder into the armpit of a large and ailing teammate. “Big men with lots of muscles need lots of oxygen and can get sick very quickly,” Moharrak says. “It didn’t smell very nice, and so ‘princess’ braced him down the whole thing,” she says. 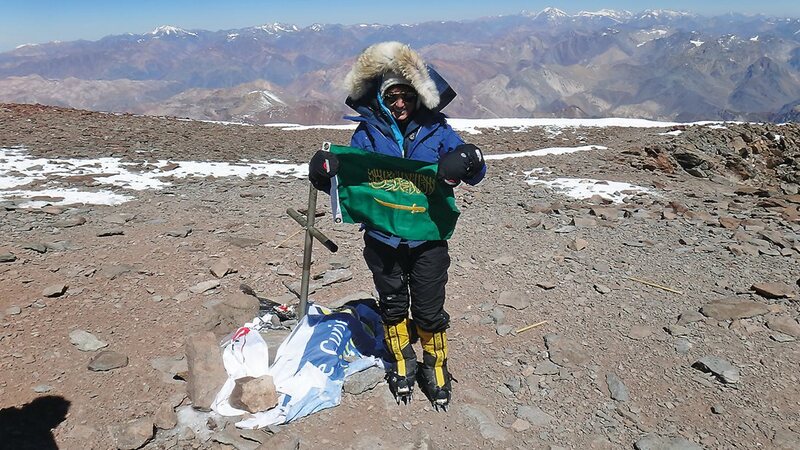 Five weeks later, she climbed 6,961-meter Aconcagua, South America’s highest. Left to Right: Mount Kilimanjaro, Tanzania, November 9, 2011; Mount Elbrus, Russia, August 28, 2012; Vinson Massif, Antarctica, January 18, 2013. Hassan says that more than anything, he wants his daughter to be safe. Trust had to be earned. With each expedition Moharrak would plan, she came to anticipate “no” from her father. But Moharrak would persist, convince and go. But Hassan drew one firm line. “Don’t ever ask for Everest,” he told her. He was unaware that climbing Vinson and Aconcagua had inspired an even higher goal, that of membership inone of the world’s most exclusive clubs, with only some 500 members, fewer than 75 of whom are women. It isa club with one entrance requirement: Get to the top of the tallest mountain on each continent. While still in Antarctica, Moharrak turned 25. Her parents called and asked what she wanted for a gift. Quietly, she applied for an Everest climbing slot for the 2013 summer season. She called home. “I applied and I got accepted, and we have to pay the down payment now, and I believe I can do it,” she recalls saying. Days later, Hassan and Yasmine came to her with a piece of paper. “I signed you up and I paid,” her father said. Moharrak was stunned. “Now I believe you can climb the mountain, but promise me two things: First, don’t push yourself beyond your capabilities. Crampons clamped to her boots help Moharrak and her teammates maintain footing on the route up Mount Everest. 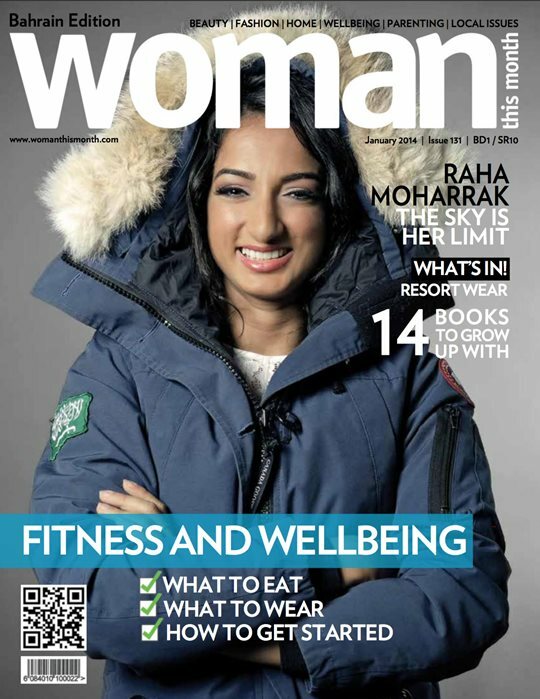 Moharrak became one of some 60 women who have reached the summit and, at age 28, one of the youngest. 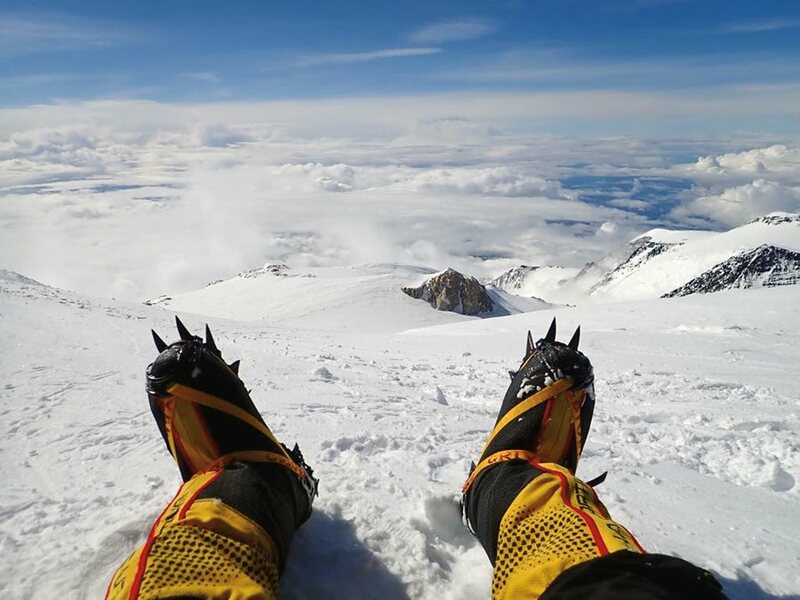 With fewer than 15 minutes to spend at the summit of Mount Everest, Moharrak sat down to absorb a view seen for the first time through the eyes of a woman from Saudi Arabia. On May 18, 2013, she stood on the roof of the world. She held a Saudi flag her father had given her. She found him a rock. Four years and one month later, led by Hahn and three other guides, Moharrak and her seven fellow climbers set out from Kahiltna Glacier base camp for Denali. Each climber carried a 25-kilogram pack and dragged another 25 kilograms of gear and food on a sled. The trek was hard. Long. As they trudged, the two Germans, five Americans and Moharrak got to know each other and their guides. “We were like absolute misfits at the start,” Moharrak says. Moharrak recalls the evening, at 4,330 meters at Camp 3, that turned into a poetry reading. “One of the guys, who I called Mr. Music Man, because he always had music, was one of those social people. He always wanted us to do something together,” she says. “Whether it’s playing charades or storytelling, or whatever. One wrote a haiku about pasta. Moharrak wrote about the mountain and her father, who was recovering from a difficult heart surgery. Denali, we dreamt of your summit for years. But only the brave and strong perseveres. Your beauty is only eclipsed by your might. And your weather, it would give me a fright. Because without it, we’ll probably fall down. I have come a long way to live this dream. And I couldn’t have asked for a better team. From sand to ice, the contrast is clear. But I have never let that feed my fear. But Dave Hahn will make sure there are no kinks. You are the last of my seven-summit quest. And also, my very sick father’s final request. I wish a second attempt you won’t deny. So please be merciful on my team and I. Top to botom: Aconcagua, Argentina, February 26, 2013; Mount Everest, Nepal-China border, May 18, 2013; Mount Kosciuszko, Australia, October 13, 2013. The weather held. The team continued up. Moharrak began to feel uneasy again. Around 4,000 meters, where the oxygen level is half that of sea level, a team member became overwhelmed and decided to descend. Two of the guides went down with him. Soon afterward, another had to be cajoled and physically assisted to make it up to Camp 6 at 5,250 meters. They lost a precious day. Seeing two strong people so affected by the mountain also began to play with her mind. Memories of her 2014 attempt flashed afresh. No wonder: It was in this exact spot where, that year, a snow slide had blocked her team’s path to the summit and, before they could turn back, the sudden blizzard forced Moharrak and her American and Russian teammates to shelter in a small tent for eight days of wind, snow, rationed food, weakening bodies and prayers just to make it down alive. When the skies cleared, they made a break for it. It took them 20 hours. On the flight back to Dubai, Moharrak felt claustrophobia. She developed ulcers. She lost toenails. Perhaps hardest of all, mentally, she felt beaten. It would be a year before she put on hiking boots again. When she unzipped the flap of her tent on July 2, she couldn’t believe it. No storms. No wind. Sun lit the slope to her seventh summit, now three kilometers away and 1,000 meters above. Still she felt wary, she says. This day would be the hardest. As they reached the first ridge, she coached herself. “You know what? Calm down, Raha. One step at a time.” Their pace was steady, but she could feel forces outside of herself slowing her down. For the first time on the climb, doubts entered her mind. After cresting a rise, she stopped. She could see the summit. It gave no relief. Her nerves began to take over. Thoughts ran through her head. Moharrak and the team make their way from Camp Five on Denali, left, and continue on up to 4907 meters, center, where Moharrak says the air was noticeably thin. After summiting, now on their way back to basecamp, right, the team had to wait for freezing temperatures for safer travel among crevasses. A storm could roll in. A teammate could slip and cause her to fall. One of the guides noticed. She came down to Moharrak. Her clouds of doubt began to dissipate. The team ascended the narrow summit ridge, where a step to the right or the left could mean your life would depend on the rope that linked you to your team. Morrarak was last on the line. “My eyes were just starting to tear up, because all I could think about was my parents, and my dad, and being here. When I finally got to the top, they all knew it was my seventh. They all started clanging their ice axes, like, clink, clink, clink, clink, clink, and they’re all like, ‘Seven! Seven! Woo!’ and screaming. I had a very amazing welcome at the top. Three weeks later, she says, her toes are still black and blue. 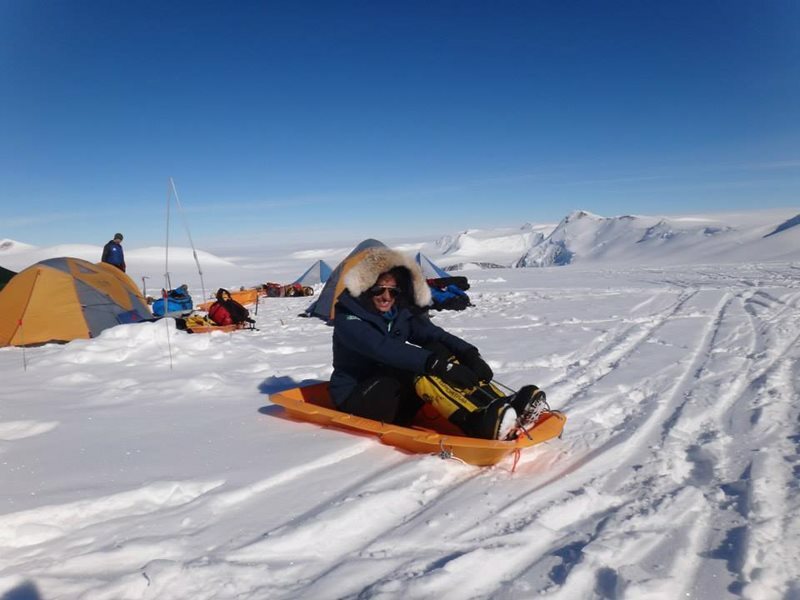 Speaking from her parents’ home in Jiddah, Denali fresh in her mind, Moharrak says the walk she is most looking forward to next is down to a beach. She’s unlikely to rest for long. 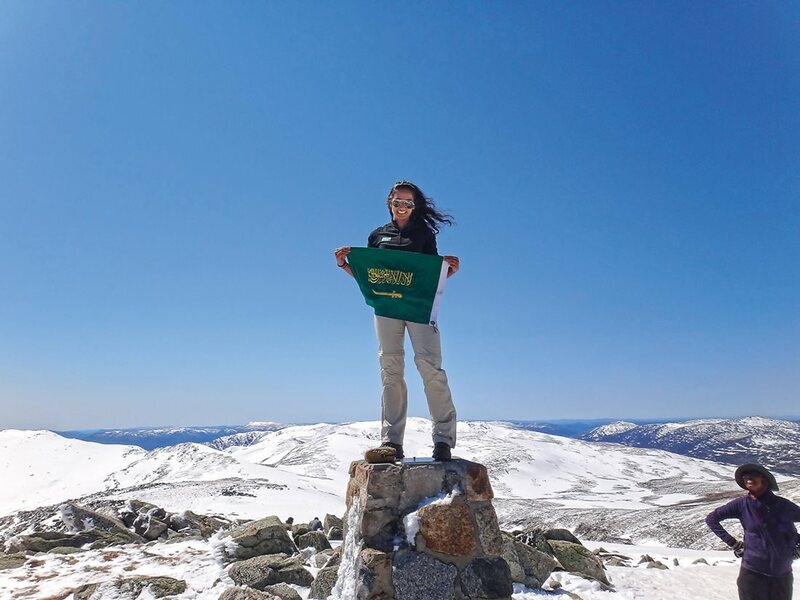 As she scaled mountain after mountain, the world has begun to take notice. Her face appeared on magazines. She had television interviews. Nike and Lipton Tea enlisted her for advertisements. She won the 2014 Global Thinkers Forum Award for Excellence in Pioneering and the 2016 Emirates Woman Achiever award. On Instagram, she gathered more than 25,000 followers. She began writing a book. To many, Moharrak has become a portrait in strength and perseverance, a role model in her country, the Arab world and beyond. It’s attention she isn’t always comfortable with. She told few people about her summit to Everest,despite global publicity. As for Denali, she waited weeks before posting her achievement on social media. 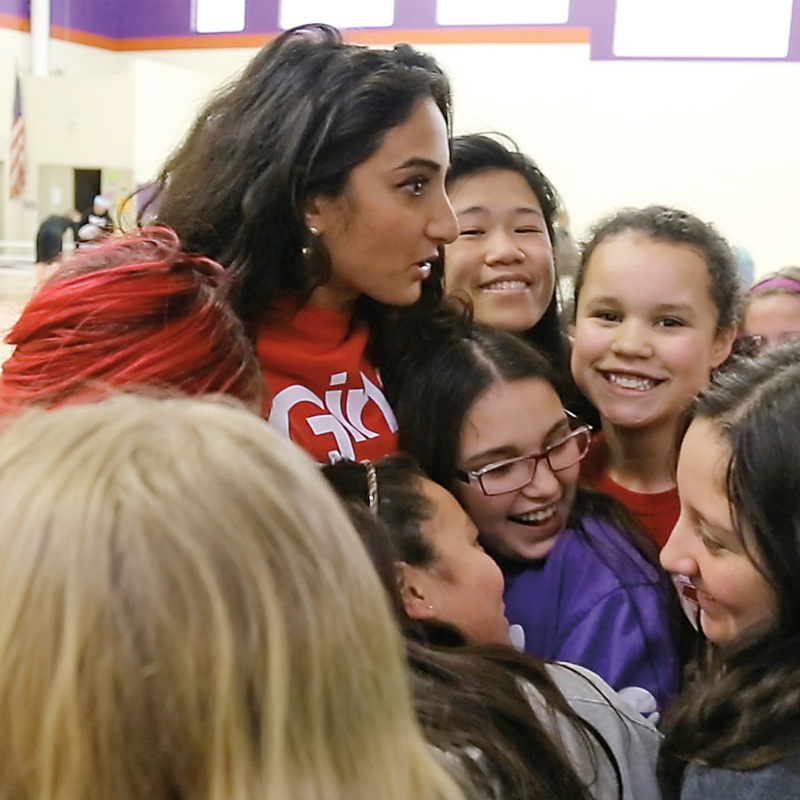 In Denver, telling her story to the girls of gals, she is doing just that. Her talk finished, she is swarmed by students who just want to get close, ask a question, share a hug or take a selfie with her. “I really enjoyed your speech. It inspired me,” says one. Finding a gap in the crowd, a short girl wearing a white headband and a red sweatshirt walks up and commands her attention. Moharrak bends over, eye-to-eye, and smiles. Students hang on her words as Moharrak, clad in a T-shirt from her newest fans, encourages them to “follow whatever dream you want. All I wanted was to prove to myself that I could attempt the impossible and maybe even achieve it."